My lovely housemate Emily arrived from her exciting holiday in America a few days ago and she brought back a few goodies with her. There were a fair few but the most exciting item was definitely this! 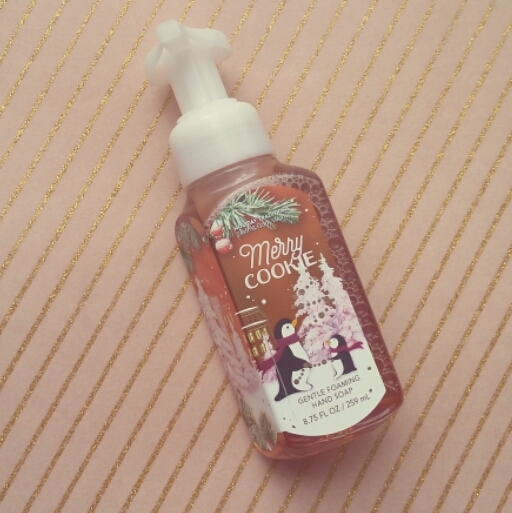 A Bath and Body Works Christmas hand wash in Merry Cookie. I found it under the sink yesterday morning and I think I've been thinking about it ever since. It smells just like Christmas should. It's warm and sweet and delicious. I really think I would eat it because it smells so good. I just love hand washes that leave your hands smelling good. Every now and again you'll move your hand near your face and this beautiful smell comes across. Bath and Body Works when will you come to Melbourne?